This recipe for easy dinner party chicken will take all the stress out of entertaining. And it’s perfect for a delicious weeknight supper too! Welcome to my favorite, always reliable, completely delicious, never-fail dinner party recipe! This easy dinner party chicken has been my go-to meal whenever I need something I can whip up quickly, that uses simple ingredients, but still comes out with the pizzazz you NEED to make a special evening special. And if you are wanting to make a regular old Thursday night special, it’s perfect for that too. So if you are wanting a can’t miss dinner party recipe full of bright and colorful veggies and a luxurious, deceptively simple sauce, grab some chicken and let’s make it! I like to get regular sized chicken breast halves (not the thin sliced kind) and then pound them a little until they are a uniform size, about 1/2 an inch thick or a teeny bit more. These are going to cook up in about ten minutes in your trusty skillet, and you are going to use the drippings along with some wine and cream and tomato paste to whisk up that silky sauce. 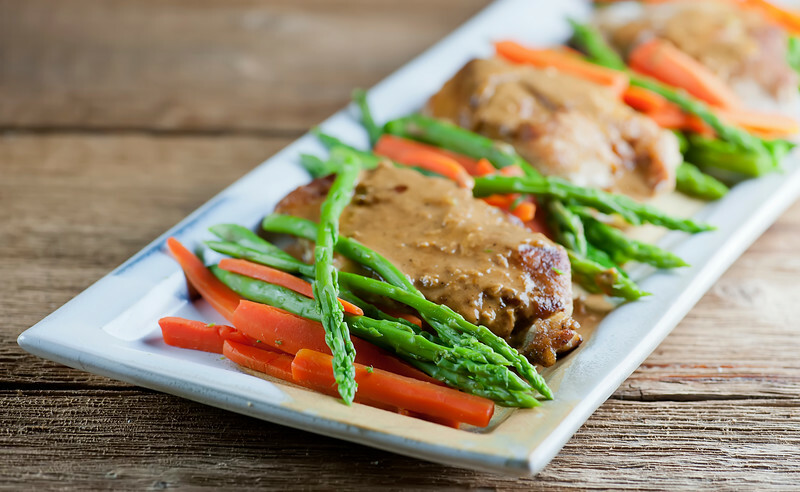 One of my favorite sauce secrets is to stir in whatever juices collect on the plate where the cooked chicken is resting – they give the sauce a lovely, rich flavor. This sumptuous chicken and sauce is going to be surrounded by some cheery carrots and asparagus that you have simmered just until they are tender…and that’s really all there is to it. Well, that and the fact that you will be surrounded by compliments for your dinner party skills. Do you have a go-to, can’t miss dinner party favorite? Let me in on it (appetizers and desserts accepted too! ), because there is no such thing as too many dinner party recipes! Bring a medium pot of water to a boil and add asparagus and carrots. Cook until veggies are tender, about 5 minutes. Drain and set aside. Put chicken and flour in a zippered bag with a pinch each of salt and pepper. Close and shake until chicken is coated. Melt 2 tablespoons of butter in a heavy deep skillet over medium high heat. Add chicken and cook until golden and cooked through, about 4-5 minutes per side (chicken should measure 165 degrees on an instant read thermometer. Remove and set aside. Add remaining butter to skillet along with the wine and bring to a simmer. Whisk in the tomato paste, followed by the cream. Simmer for 2-3 minutes, and finish by whisking in any juices from the plate where the chicken is resting. Season sauce to taste with salt and pepper. Place a chicken breast on each plate, surrounded by veggies. Ladle a generous amount of sauce on each plate, and the dinner party is ready! Love the ease of this dish! So perfect for quick entertaining! It’s one of my tried and true! Happy weekend, Luci! This looks wonderful! Since asparagus is hit our miss around these parts, I can see some baby Yukon gold potatoes as a good substitute. My favorite dinner party dessert actually came about from a cupcake fail. The cupcakes had all shrunk in their wrappers but were still very tasty. So rather than throw them away, I turned them into a trifle. A pineapple upside down cake trifle. Cooked some pineapple chunks in butter and brown sugar to caramelize them a bit and then layered this with cupcake chunks and whipped cream. Yummy and very pretty in the clear glass bowl! Happy Friday, Kate!